Phew. Maybe Windows Blue (or Windows 8.1, as Microsoft is now officially calling it) won't be so blah after all. But Microsoft is betting big that a fresh coat of paint will be enough to bring users back into the fold. On paper, at least, Microsoft's disclosure of some of the new key features within Windows Blue take some definite strides forward, with entirely new components, such as Internet Explorer 11, anchoring the new release. Microsoft hasn't abandoned its original vision. Rather, it’s just compromised it a bit by delivering features that users have been clamoring for. Look, Microsoft is saying. Windows 8 is friendly. What Microsoft still isn't overtly acknowledging, however, is that there are two groups of users: those who have seen Windows 8, have been baffled, and have walked away; and a second group, who understand how Windows 8 works and what Microsoft is trying to do. Antoine Leblond, Microsoft's corporate vice president who authored today's blog post introducing the new features, is clearly addressing the latter group. In many ways, the fundamental problem with Windows 8 is that the modern interface of the Start screen works best on a tablet—this despite the fact that the vast majority of users first experience it on a PC. The array of apps and widgets is bold and beautiful—and daunting. Apps dominate the entire screen, and even the ability to "snap" two apps to the same screen doesn't eliminate the fact that a lot of screen space goes to waste. 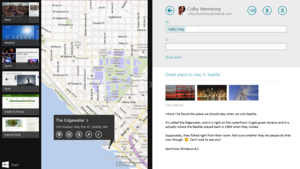 Windows 8.1 will allow users to Snap apps to various sizes. 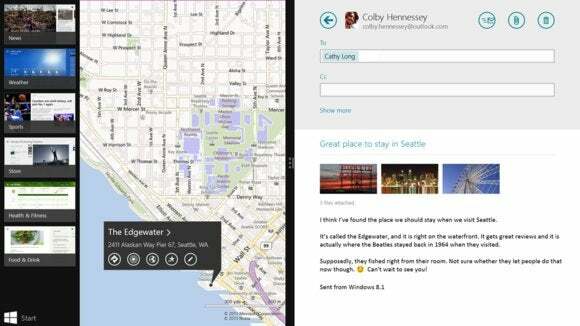 Windows 8.1 will allow users to snap apps to various sizes, and allow up to three apps to share the same screen. But that doesn't change the fact that a PC user who mistakenly works within the modern environment is going to be as frustrated as he or she always was. Microsoft's more experienced users already know to jump right into the PC-friendly Desktop mode. Microsoft confirmed earlier reports that the Start charm will be moved to mimic the old Start button of Windows 7, and the Start page will be rearranged. Leblond also referred to options to change what the corners of the screen do, and the option to boot to "alternate screens"—which a Microsoft spokeswoman confirmed was a boot-to-Desktop mode. Shared backgrounds between the Start page and Desktop, plus the ability to use the lock screen to display photos, are designed to ease new users into Windows 8. These aren't functional improvements. These are sops to those who were turned off by Windows 8. Look, Microsoft is saying. Windows 8 is friendly. Near the bottom of Leblond's post, Microsoft outlines the features that its more experienced users will prefer: a better PC-wide search experience, powered by Bing; access to the full range of PC settings without needing to hunt down the Desktop control; improvements to SkyDrive, including offline syncing; and the needed ability to sync a user's apps and settings across new Windows devices to ensure continuity for existing customers. Microsoft also said that its built-in apps, such as Music and Photos, will be improved, including the ability to better edit and adjust photos within the app itself. And there's also Internet Explorer 11, which will undoubtedly be a selling point all its own. Aside from the "improvements" to search (which look like features adding unnecessary complexity to the process), most of the other enhancements look like welcome additions. Future disclosures of what Windows 8.1 has in store will be rolling out over the next few weeks, Leblond wrote, leading up to what many expect will be a preview release by the end of the month. "Windows 8.1 will advance the bold vision set forward with Windows 8 to deliver the next generation of PCs, tablets, and a range of industry devices, and the experiences customers—both consumers and businesses alike—need and will just expect moving forward," Leblond wrote. "It’s Windows 8 even better. Not only will Windows 8.1 respond to customer feedback, but it will add new features and functionality that advance the touch experience and mobile computing’s potential." We all know the problems Microsoft faces: the rise of Apple and Android tablets, the demise of the traditional PC, and the lack of touchscreens that held back the early Windows 8 experience. But Leblond's statements aren't those of a company back on its heels. Microsoft is charging ahead. For its sake, it had better hope that it doesn't leave its more traditional users behind.